In a blender, add all the above ingredients and blend. You also need beef fillets. Marinate the beef fillets with the chimichurri. In a pan, add some oil enough to shallow fry the fillets and cook the fillets. Turn the fillets and cook cover stirring occassionally until the fillets are well cooked, and there is little or no liquid left. Depending on the thickness of the fillets, you might not need to add water in the cooking process. Serve the fillets as a side dish to any rice or salads. 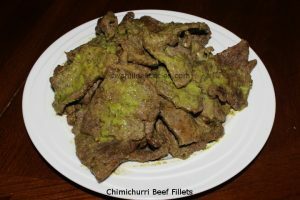 If there is any more left over chimichurri sauce you can pour over the fillets when serving.